Walter Surface Technologies (WST), a leader in surface treatment technologies, has developed a revolutionary and eco-friendly solution for heavy-duty industrial cleaning. "Our product developers have succeeded in creating NATURE BOOST-- a derivative of natural material widely available -- and using it as a powerful ingredient in new cleaning solutions," says Pierre Somers, Chairman and CEO of Walter Surface Technologies International. According to Somers, using a natural product, in this case vegetable extract, to make highly efficient and ecological cleaning products is another major step by WST in achieving its mission of "Making Green Work". Nature Boost is a new additive derived from vegetable extracts exclusive to Bio-Circle Environmental Solutions. This new ingredient is obtained from a by-product generated in the vegetable processing industry, thus not impacting the cost of food. This unique raw material has excellent solubility of oils, greases, inks, adhesives and even paint, thus making it a very attractive alternative to traditional petroleum based solvents. What makes the Nature Boost additive so impactful is that it is not flammable, does not emit Volatile Organic Compounds, is non-toxic and bio-renewable. No other petroleum distillate or natural solvent can boast these benefits! The addition of NATURE BOOST to the Bio-Circle Environmental Solutions product line means industrial workers now can choose from 3 efficient and green cleaning alternatives. Not only are they safer for workers, but more cost effective than toxic solvents. CB 100 is an aqueous based micro-emulsion of NATURE BOOST additive with surfactants. 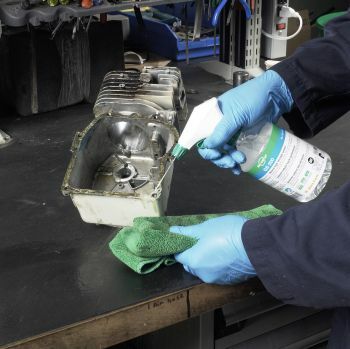 Designed for bulk cleaning and degreasing, CB 100 is excellent at removing oils and greases. It will also remove ink, rubber marks, tar, wax, carbon, soot and paste. CB 100 is compatible with all metallic alloys and can be applied with a trigger sprayer, pressure washer, or heated dip tank. GS 200 contains the NATURE BOOST additive in its undiluted form. This natural, high-performance "green solvent" is excellent at removing glue, ink, paint, sealant and wax from metallic surfaces. It will also remove oils and greases. GS 200 is NSF certified for use in food plants in the United States. GS 200 can be applied manually with a trigger sprayer or with a dip tank. Bio-Circle ULTRA is the new heavy duty version of Bio-Circle L. Bio-Circle ULTRA is formulated from the original Bio-Circle L solution with the addition of NATURE BOOST additive. 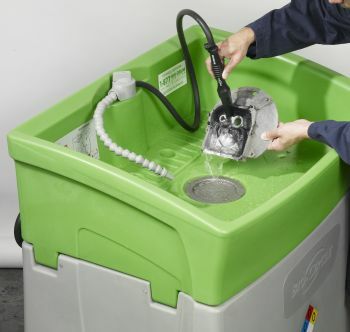 When used with the Bio-Circle parts cleaning system, Bio-Circle ULTRA removes crude oil, bitumen, heavy grease and even baked-on contaminants. Bio-Circle ULTRA is ideal for the mining, oil and gas, heavy equipment maintenance, rubber/tire production, shipyard, and steel industries. Bio-Circle ULTRA is NSF certified for use in food plants in the United States. Like the original Bio-Circle L solution, the new NATURE BOOST-based products are biodegradable, VOC-free, non-flammable, and NSF-certified (CB 100 is pending certification). CB 100, GS 200 and Bio-Circle ULTRA were officially introduced in US and Canadian markets in January 2013.